The Nordstrom Anniversary Sale is Here! What is the Nordstrom Anniversary Sale and why is it so popular? After weeks of anticipation, Early Access to the Nordstrom Anniversary Sale finally kicks off tomorrow! Early Access runs from July 13th - July 20th before the sale opens to the public. Believe me when I say that shopping the sale during this window gives you a major advantage. The hot-ticket items sell out super fast, and speaking from experience, they're not always re-stocked before the sale opens up to the general public. I can't tell you the number of times I missed out on my wish-listed items because I procrastinated and kept waiting for re-stocks that never happened. Lesson learned. So, who can shop the "Early Access" sale? Only Nordstrom cardholders. If you have a Nordstrom debit or credit card, you're golden -- you get to shop the sale a whole week before the sale opens up to the public! If you're not a cardholder and missed the July 9 deadline to apply and receive your card in the mail prior to the sale, don't fret - you can still apply HERE and once approved, gain immediate access to the sale and start shopping online! You'll also want to follow my shopping strategy below! Strategy 1: Start creating a wish list now! Start browsing the Nordstrom website HERE (see the top sellers below if you're not sure where to start) and add all your favorite items to your wish list. This will allow you to easily access and track them in one place so that when the sale goes live to the public, you can quickly move them to your shopping cart. Note: this doesn't guarantee items won't sell out from your wish list, but it will help you to see which ones are low in stock or have already sold out so that you can quickly adjust your shopping plan/budget accordingly. It never hurts to plan ahead! 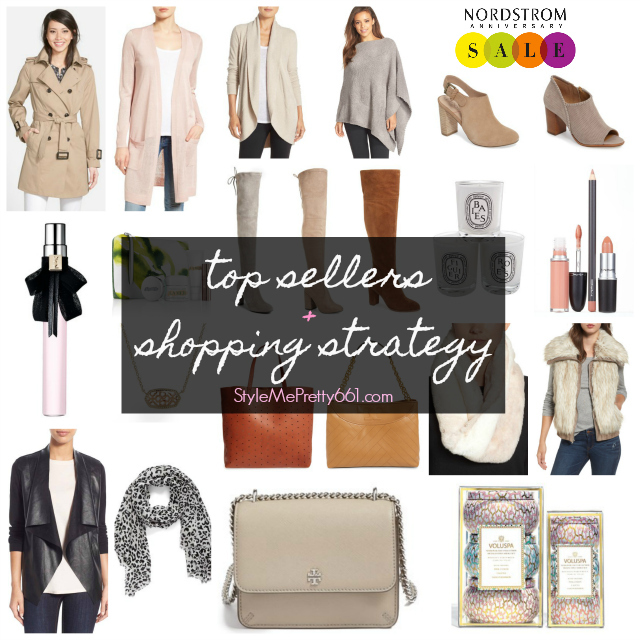 Strategy 2: Shop early and don't hesitate on any items you're absolutely loving! I'm not exaggerating when I say that items have been known to sell out within minutes, even during the check-out process, so if you love it, act fast and buy it! Nordstrom is renowned for their excellent customer service and return policy. Free shipping and free returns with no time limit allow you to buy now and return later if needed. If you're in-between sizes in a particular item, I suggest buying both sizes and returning the one that doesn't fit. Buy now and regret nothing. While the exciting reveal on all the sale goodies will take place early tomorrow morning (happy dance! ), I thought it would be fun to round up all the #NSale top sellers by category, based on previous years' sales and also on my own personal observations and experiences. Some of these are not guaranteed to be included in the sale, but have made my list based on their popularity as well as my personal preference. Early Access to the Nordstrom Anniversary Sale 2017 just went live! I've culled through all 46 pages of the #NSale, and let me just tell you -- there are some really amazing deals this year! I'm especially loving all of the suede knee-high and over-the-knee boots that are included as well as the longline cardis and vests in varied neutral shades of camel and grey; they'll be perfect come Fall! My favorite leopard scarf that sold out quickly last year is back as well as some of the wool coats I was eyeing. The hard part is now choosing a color! Don't forget the Beauty Exclusives! They're chock-full of some of the best value sets and #NSale exclusives that are perfect for stocking up on your favorite everyday perfumes, moisturizers, and makeup at a fraction of their usual price! They also make great gifts, with several priced at only $50 or less! The YSL lip set is a top pick, as is the Sugar Lip Set. I use these lip glosses and lip balm regularly, and these sets are almost the same price as only one of each regularly-priced gloss/balm! Several of the other smaller-sized sets are ideal for traveling, too; I always make sure to keep a few on-hand in my toiletry bag. Have you already started shopping? Which items are you eyeing? Remember, if you see something you love, don't hestitate or it could be gone!